In the last 18 years, I've taught English to French high school students in New Brunswick, finished university in Edmonton, interned with the Glenbow Museum in Calgary, become a newspaper editor in Mexico City, and worked on the Olympics in Vancouver, with several other jobs sandwiched between. Boyfriends, friends, even relatives have come and gone. Through it all, there was my six-toed tabby cat Oliver. In 1992 I was living for the school year in Saint-Quentin, New Brunswick when a friend told my roommate and I he’d found a stray cat and thought we should take it in. We called the orphan Oliver. Given his many-toed mutant-ness, my brother once called him Chernobyl kitty. A friend called him Hemingkitty, after old Ernest’s polydactyl cats. He was half-wild – tearing through the apartment and charging at us for no apparent reason, claws out – and all affection. He had the loudest purr and the biggest paws. Our neighbour and boss had a retired police dog who would chase Oliver under the nearby wood pile and up the nearby telephone pole, but when the dog wasn’t around, the cat swaggered through a neighbourhood populated by six-toed kittens that looked suspiciously like him. When the school year ended and we were headed home, Louise and I put up a “cat to give away” notice. No one called. If someone in the tiny town wanted a stray cat, they just had to open their door and put a can of tuna inside. So I bought a cat carrier and cat plane ticket and brought him home with me. Introducing him to my then-one-year old nephew was a little nervewracking – this was a 24-clawed cat who wasn’t afraid to use each and every one of them – but he purred while Ryan drooled on him and pulled his tail. He'd mellowed. Neutered but undeterred, he wandered in and out my basement apartment window, coming home smelling of perfume or barbecued steak, sometimes with a headless mouse for me. (Apparently mouse brains are the cat delicacy.) Once, when I had the flu, I was wrapped in a duvet on the futon watching some old movie and saw a furry object out of the corner of my eye. Turning to pet it, I screamed when I discovered it was a dead squirrel. Oliver seemed a bit perturbed at my reaction to his get-well present, but he never held a grudge. After every plane ride, accidental tail-step, or vet visit, he buried his head in my stomach as if to crawl inside me for protection. The next door neighbour (also my boss; how did I end up living next to two of my bosses?) had a toddler son, Peter, who loved “Oliler.” When I moved away, his father asked me if they could keep him, but I couldn’t give him up. He’d once gone missing for a week and I was devastated. Such a little creature left a huge hole where he’d been. Turned out a neighbour couple across the street took him in, but finally saw my signs and realized why this fat cat they’d rescued kept trying to jump off their balcony. He became an indoor cat in Calgary, city with stricter cat bylaws, and I was mercifully spared the headless mice forevermore. Oliver was – how shall I put this? – not very bright. For example, if I moved a shelf, he would continue to try to jump where it used to be. But he was a cat, not a brain surgeon, and I suspect his stupidity explained his sweetness, and why he didn’t blame me for the plane rides, accidental tail-steps, and vet visits. He used to demand to be let out in Edmonton, but in the new apartment there didn’t seem to be an outside anymore and he was perfectly fine with that. Oliver was the friendliest cat. A little too friendly, sometimes. In one apartment, the zaftig kitty squeezed himself through the impossibly narrow bars of our balcony and hopped onto our neighbour’s, then through our neighbour’s patio window, onto our neighbour’s couch. I learned this when the guy next door knocked and asked me if I had a black and tan tabby cat. In a movie, that would be the meet cute where we’d start to fall in love, but in real life it was the humiliating start of extricating my cat from an unamused man’s apartment. When I left for Mexico several years later, I had acquired another cat, and found foster families for both. Pip (I was on a Dickens kick) never returned to me. After my first year in Mexico, I brought Oliver back with me. 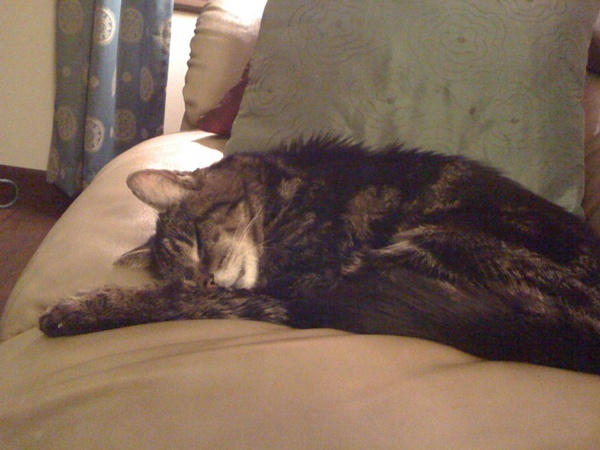 From Acadia to English Canada to Mexico – I used to say he was a trilingual cat; he could ignore me in three languages. He’d escape from our open windows and climb onto the roof of the building next door. That seemed ideal, like a self-contained kitty playground. Less than ideal were the acrobatics he did to get into the open windows of our upstairs neighbours. Again came the knock at the door: this time it was an unamused woman holding the cat like a football. When I settled in Vancouver I promised the by-now geriatric, bony cat no more plane trips, and I kept my word. Though he would have forgiven me if I hadn’t. He got older and less active. He got hyperthyroidism, then cancer, then just all-around ancientness, then a very bad couple of days. It was time, but it was the hardest thing I’ve ever done: I spent Canada Day holding him before taking him to the vet one last time that evening. I can’t write this without bawling. I can’t yet look at the many spots in the apartment that were his spots without tearing up. I can’t yet stop turning my head to check the spare room for him when I come home, or sit without expecting him to saunter up to me, or sleep without thinking he’s at the foot of my bed. I’ll eventually lose that gaping sense of his absence but I’ll never lose the memories of 18 years of his big-pawed, big-personalitied company, and even in my grief I am incredibly grateful for that. Posted by Diane Kristine Wild at 11:26 p.m.